T.Webber provides complete sump pump service, repair and installations throughout the Hudson Valley, including: Dutchess, Putnam, Westchester, Orange, Ulster & Rockland County. Our Plumbing & Drains experts are available all day, every day to help solve your sump pump problem promptly and professionally. Sump pumps are a cost-effective way to prevent major flood damage to your home and protect your valuables. A sump pump is an electric pump that is placed in the lowest point of your home (typically the basement) to prevent against flooding. When excess water is present – either from heavy rainstorms, melting snow, or major groundwater seepage – water is diverted into a pit where the pump is located. When the water level reaches a certain point, the float valve on the sump pump activates the pump and the water is pumped from the pit, removing it from the home and preventing any flooding from occurring. 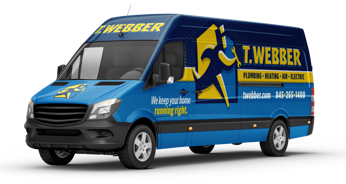 If you are having an issue with your sump pump or want to ensure it is working properly prior to a big storm, call T.Webber. Our team of Plumbing Experts can service, repair and install complete sump pump systems to protect your home from basement flooding. We can also recommend and install battery-powered back-up systems to protect your home, should you lose power.